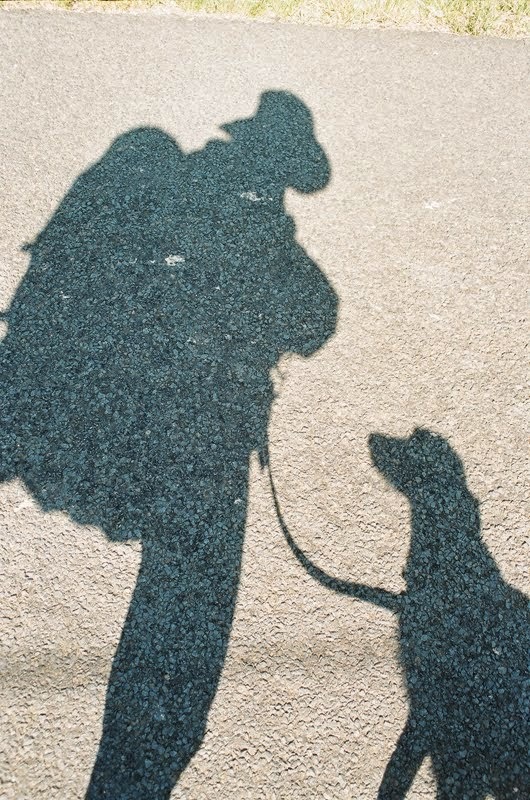 Editor: Bill Atkinson is a long standing member of the Association, having walked and cycled End-to-End more than once. 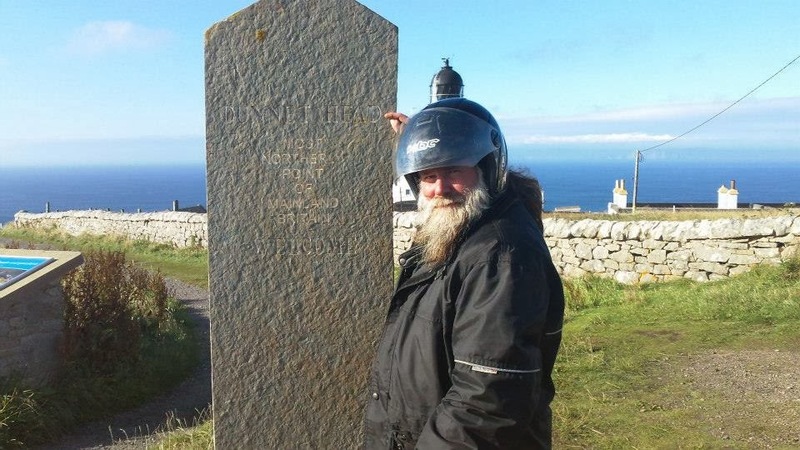 He intends to complete his cycle from Dover to Cape Wrath this June and write us a full account. I had always intended to do this in one trip and I do think it is much more satisfying all done day after day, but circumstances stopped me. I am still really enjoying it though. Over the last two months I have completed just under 800 miles of my Dover to Cape Wrath cycle. I started in Bexhill and had a fantastic day getting through to Dover. I cut across to Whitstable and then followed the coast all the way to Tower Bridge in London where I stopped to help my son work on his house. That was three days cycling. 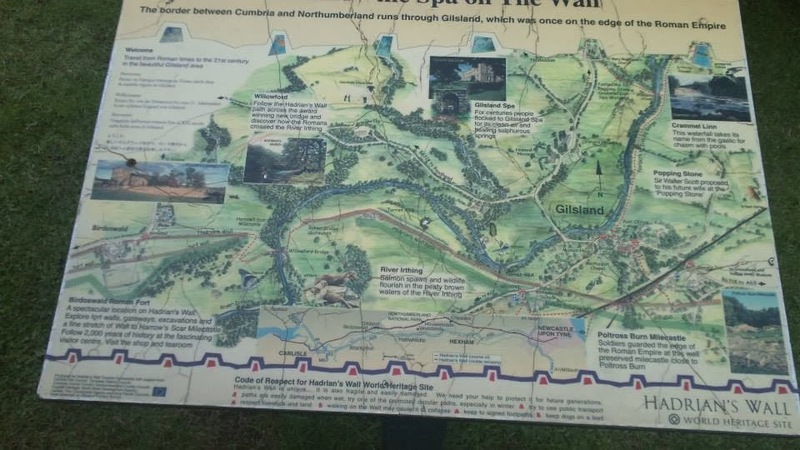 Later I went to Chesterfield and did the South-North arm of the Trans Pennine Trail, then the Leeds Liverpool Canal, and then A roads to Carlisle. 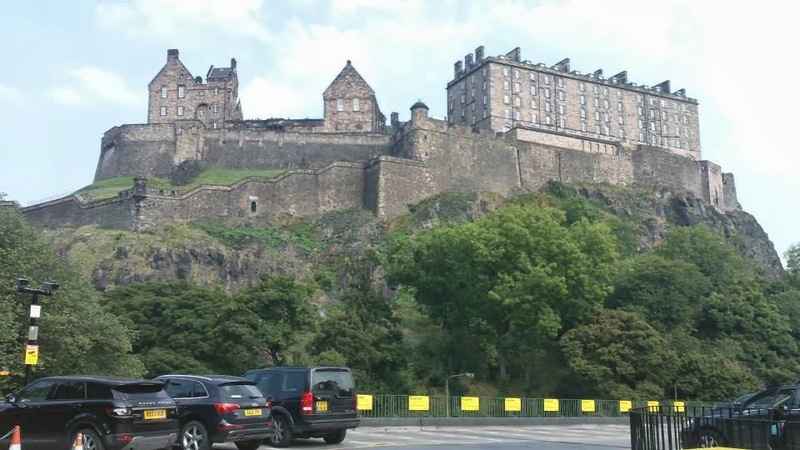 I cycled through the Southern Uplands, through Glasgow and up to Loch Lommond (mainly on cycle paths) and then west to Oban. That chunk took 7 days. I have just completed another 5 days getting from London to Chesterfield, making several visits on route. The 60 miles from just west of Aylesbury to just east of Coventry was absolutely wonderful; I had a list of villages and followed the direction signs from one village to the next. The sun shone, there were hardly any cars and the autumn countryside was glorious. I was very, very lucky with the weather: two hours of rain. I was always in the right place at the right time, and the wind was nearly always behind me. I always use B&Bs and hotels; I like comfort at the end of the day. Where possible I always use cycle tracks and cycle routes and I usually try to avoid using A roads though this is not always possible. This means that it does take me longer than someone just using roads; I also must admit I only really go quickly downhill with the wind and I always walk up steep hills. I will do the rest in June with my wife. We did a sponsored motorcycle ride on behalf of The Lullaby Trust, Essex Air Ambulance, M.A.G., and Macmillan Cancer Support. 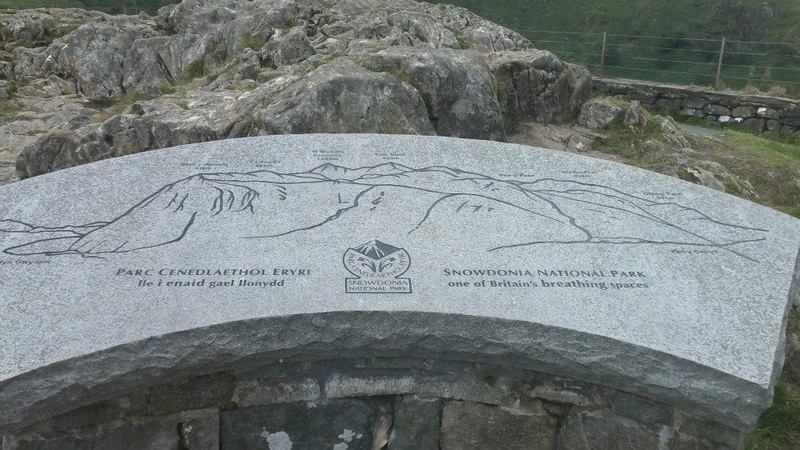 We travelled to Land's End, then to John O'Groats via the four extreme points of the British compass (The Lizard, Gorrachad Mor, Dunnet Head and Lowestoft Mor) and the peak ranges (Snowdon, Scafell Pike and Ben Nevis) and then home. The start of our epic journey! Quick stop at All Revved Up in Walton, then off to Hampshire for an overnight stop with friends. Several downpours on the way - thank goodness for waterproof bike gear! Straight forward run - 159 miles travelled today. Left in the rain after a hearty breakfast (thanks Vanessa!). Seemed like the road to nowhere - so much stopping and starting, especially round Stonehenge. The sun eventually came out and we stopped at Salt Ash for tea and biscuits with Mal & Mo - biker friends. We continued towards the Lizard, only to run out of petrol in Bodmin. A mile of Mic pushing the bike (downhill luckily) and Eve trotting behind! re-fuelled and set off for Truro only to find the road closed. After the nice policeman had admired Mic's beard and given us directions we set off once more. We were very lucky with a camp site as they had a couple of pitches left. Dinner at the local pub and then to bed. 275 miles today. Packed up and planned the route for the day. As we left, the kind lady at the booking office donated £10 for our charities - thank you Henry's Camp Site at the Lizard. We stopped at the Lizard point - 1st of our four points of the compass, got our forms stamped at the post office and off we set for Lands End. Down came the rain and we got to Lands End looking like drowned rats - not the best look for our first official photograph! We were allowed to take the bike down for the photo which made our day. Got the forms stamped and signed the book. Back on the road to Wales and the sun came out as we crossed Bodmin Moor, but hey-ho once across the Clifton Bridge down came the rain- welcome to Wales! Found the Eye of Ra rally, pitched the tent in the rain and in to the hall to party! 271 miles today. Mic got a trophy for furthest travelled and the Eye of Ra bike club had a collection for our charities - thanks guys. We started out a bit late but the weather was getting better, only slight drizzle. Steady run through the countryside, through Betswycoed and on to Snowdonia for the night. Stopped at the Mechanism museum on the way. Camped up, hot shower, food and sleep! 170 miles today. Off at 7.45 a.m., back through Betswycoed and on to the Horseshoe Pass, stopped at the Ponderosa for lunch. Weather very windy but dry. Stopped in Wrexham on through Chester and the M6 to Windermere. Forms stamped along the way. Short stop then off to Ambleside for Scafell Pike. Wrynose Pass was very steep and the bike struggled a bit but we made it. Felt like we wanted to sing giddy up! (Mic not amused at Eve's jokes at this point..... Down through Kendall and back roads to the Takoda campsite at Kirby St Stephen. A warm welcome, discount on the pitch and the use of the laundry room and showers - marvellous! Treated ourselves to a take away eaten al fresco - that's camping for you! Miles today 243. Good weather, everything dry! Set off earlyish and made our way to the Llama cafe along the A 66 for breakfast and a look at the llamas. On to Carlisle and a visit to Hadrian's wall (took a while to find it but worth the trouble) where we got a rather nice stamp on our forms. Back on the bike and off to Glasgow, roads very busy and the wind was strong. Stopped for petrol and then off towards the Highlands via Loch Lomond and the Trossachs. (Eve was able to give an awful rendition of the bonny bonny banks of Loch Lomond for which Mic refused to remove his bike helmet - said his ears hurt enough already!). 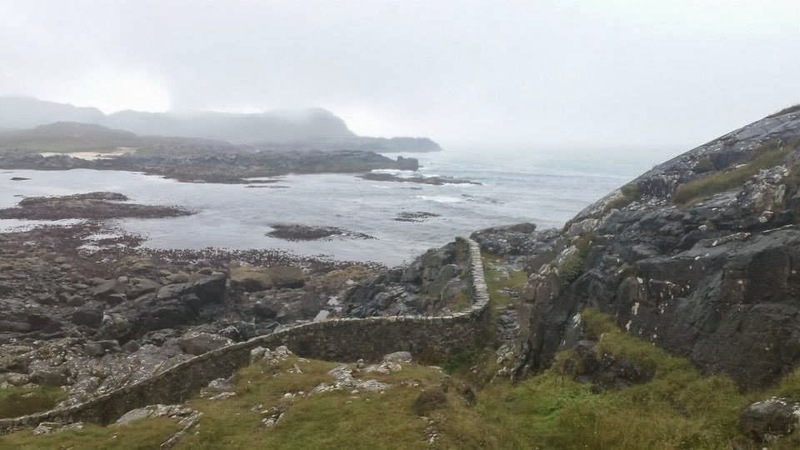 Weather became misty and damp with a lot of low cloud. Very strange experience to actually ride through a cloud. The rain started again as we got to Glencoe. 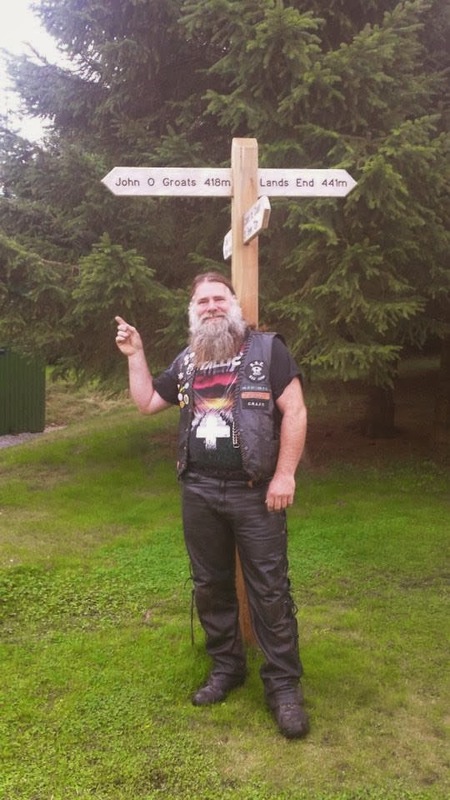 We stopped at the Green Wellie then rode to the B & B at Onich. Luxury night - proper bed and a bath! Miles today 219. The rain was back with a vengeance! Loaded the bike and boarded the ferry at Corran ready to make our way to Ardnamurchan Point (number two on our list). We got the ferry for free which was a bonus. What a journey the ride to the lighthouse was - took 6 hours up a single track with steep parts and very few passing places which very few vehicles observed, expecting us to pull over in ditches and on wet grass to let them pass. We made it and were treated to lunch as a donation to our ride by the manageress of the Lighthouse Cafe - thank you Mairi McFarlane. Quick look around, forms stamped and off back to the ferry. The bike went over on wet grass but neither of us was hurt and the bike was also o.k. Once we got off the ferry we made our way through Fort William, past Loch Ness and into Inverness for the night. No luck with a B & B but we found the Black Rock Camp Site at Alness. Miles today 213. Off to John O'Groats after finding the camp site laundry room and ironing the map dry! Off to Wick for a pit stop and to get our forms stamped. Weather o.k. but more low cloud and mist along the coastal route. 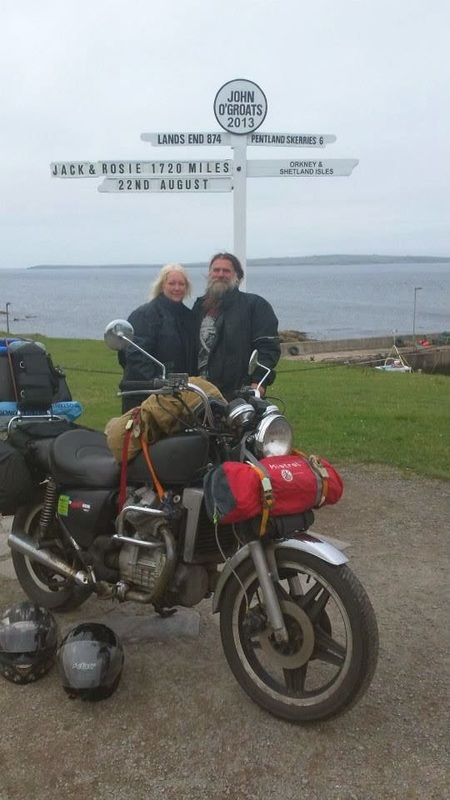 Once again we were able to get the bike in our official photograph at John O'Groats we were very proud of our end-to-end stamp and celebrated by getting the t-shirts as we'd been there and done that! The sun came out and we could see the outline of the Orkney Islands - amazing! On to Dunnet Head for point 3 of our journey. Stopped at B & B near Dunnet Head for the night. Miles today 134. 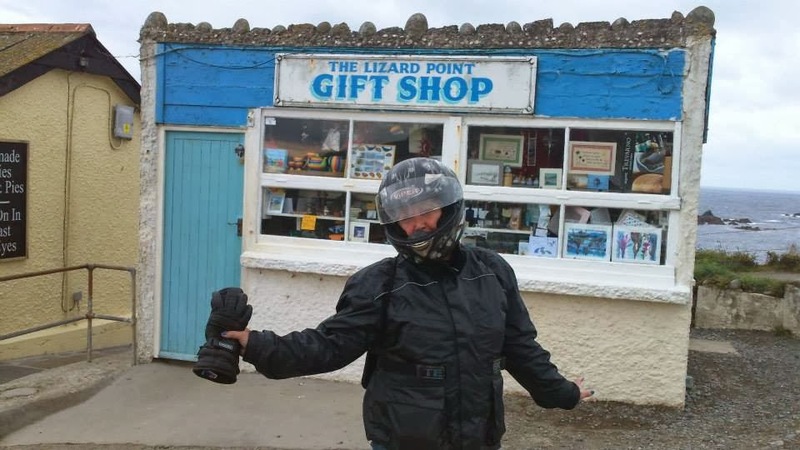 Found out that the B & B proprietor had been a keeper at the Dunnet Head Lighthouse and heard a few interesting tales about life in the Highlands. He & his wife gave us a donation for the charities - thank you Mike & Liz O'Donnell. Lovely big breakfast then time to pack up and head off to Aviemore. Rode to Lairg and over the Bonner Bridge. Arrived in Aviemore and registered for the Thunder in the Glens Rally. Got our forms stamped, pitched camp and set about enjoying our R & R. Miles today 192. Wandered round Aviemore - found a launderette - ooh the excitement of clean dry clothes! Watched the ride out - the sound of all those Harley's definitely was Thunder in the Glens! Weather wet on and off but a well deserved restful day. We met some new friends - Beth & Bill from Alness, who donated a painting to our charity raffle. Back to the rally and the evening's entertainment - Celtic Drummers and fireworks - Amazing! Managed to get some mending done - Mic's leathers and Eve's helmet. Then off to Loch Ness to find the awesome beast (no luck but a lovely day out). Sunshine all the way and a special Nessie stamp to boot. Found a lovely place for lunch with a young boy piper practicing on the green. Back to the rally to prepare for the homeward run. Miles today 96. Packed up and set off for Hawich. The bike was not performing as it should and Mic thought it was due to the luggage and being two up, however we found it was due to a flat tyre. After a petrol stop and pumping up the tyre we set off once more towards Edinburgh where we took some photos and had lunch. We had to resort to using the Sat Nav to get out of the city!! Hottest day so far and the journey through the Cairngorms was all the more pleasant for it. Made or way to Hawich and the B & B - not as good as the others but we were indoors clean and dry! Had a look round the town, had dinner and then back for a good nights sleep. Miles today 197. After breakfast and a look around the B & B's cashmere outlet we set off to St Boswell to visit the William Wallace memorial. The walk was lovely and we got some good photos but then found that the back tyre on the bike was worn to the steel rim. Mic managed to get hold of Rides & Rallies who got us information on where we could get a new tyre - thanks guys. We set off for Newcastle (nearest place to get what we needed) and eventually found the bike shop. We were able to get another tyre and as luck would have it, someone to fit it. 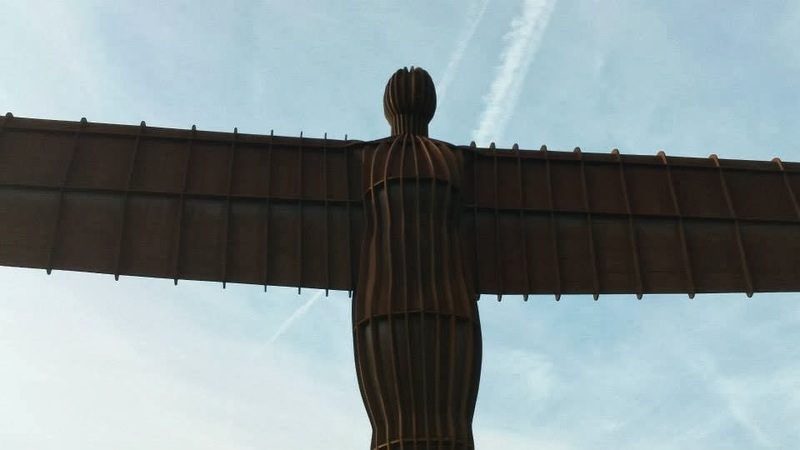 Loaded the bike up once more and made our way towards Gateshead and the Angel of the North. An awesome sight as we travelled towards it and even better close up. Onwards to Whitby where we found a camp site next to a pub. Unfortunately the pub didn't do food so we had fish & chips in Whitby. (lovely!) Miles today 134. Time out in Whitby, sightseeing for Eve and a biker haunt for Mic! After some lunch off to Scarborough where Mic had to adjust the gear cable. 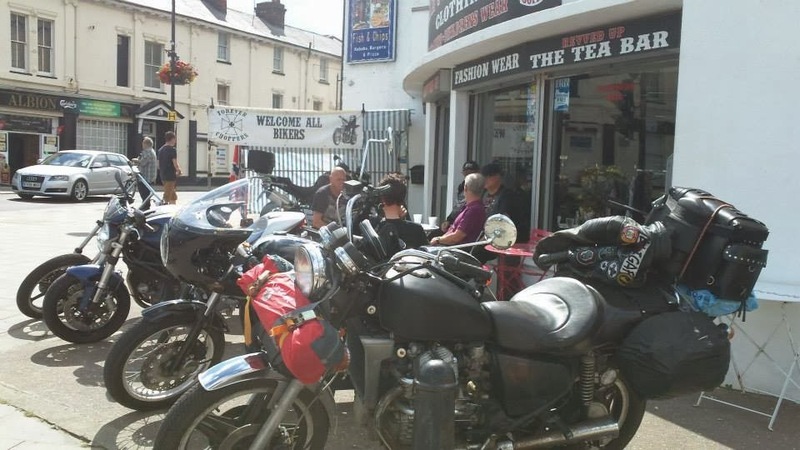 We had stopped on the sea front by a cafe which was biker friendly, giving a 10% discount to all bikers! The weather was lovely and warm and the sea air bracing! Once the bike was fixed we set off for the camp site near Bridlington - Wold Farm. Set up the tent, into town for dinner then sleep. Miles today 56. Leisurely start today, packed up and headed towards the Humber Bridge via Flamborough Lighthouse - saw the only puffin on our journey but alas it was a wooden one! Onwards to Lincoln, there were high winds on the bridge and the bike got swept along in the slip stream of the lorries and coaches going past. Had a look at the Cathedral in Lincoln and got our forms stamped then made our way towards Kings Lynn, over to Hunstanton and the Diglea Campsite for the night. Set the tent up and headed for the camp club house where we did the hi-di-hi bit and joined in the quiz night. We didn't win but got a prize for the best team name. Good weather today and miles travelled today 170. Homeward bound. Strange how on the last day nothing seemed to fit in the saddle bags! With the bike loaded for the last time on this journey we set off on the last leg. Stopped at Sandringham but her maj was not available for tea and scones so we made do with a special stamp for our forms and cup of tea. 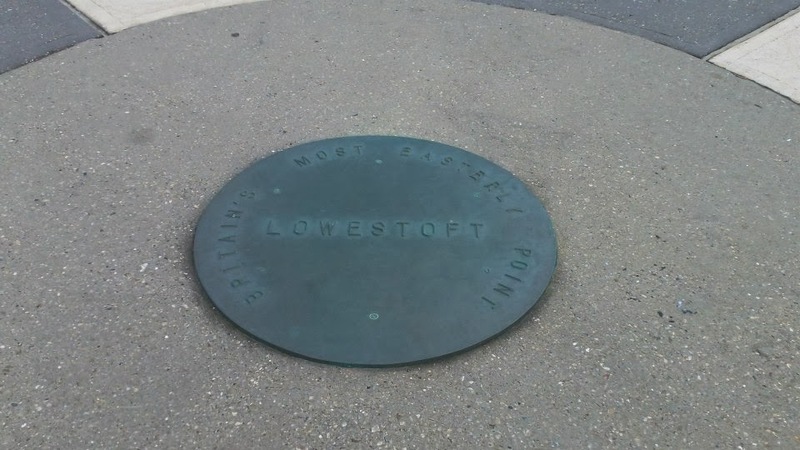 Off again to Lowestoft for the final compass point and a look in the Lifeboat Museum. Couldn't get a Lowestoft stamp but the curator at the museum signed our forms. 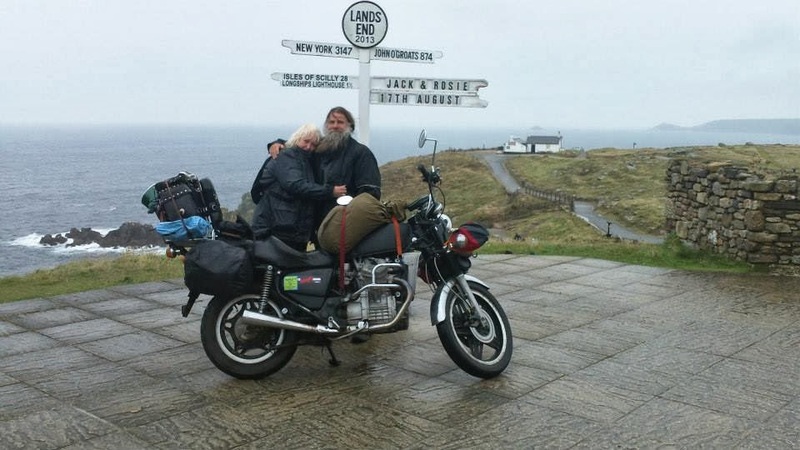 What a journey - 2,817 miles on an old 1982 Honda CX500 that cost £500,00, four points of the British Compass and Lands End to John O'Groats, fitting in Snowdon, Ben Nevis & Scafell Pike (not climbed but maybe an idea for another time.......). Total raised for the four charities £1166.38 (MacMillan, M.A.G., Air Ambulance & the Lullaby Trust). Having been brought up on a diet of American television and films; I was drawn to the Toorak Hotel in Torquay in late January by friends who had hinted to me that there was to be a confabulation between a Mr T and Darth Vader. Readers of this who also attended that weekend of 25th will by now realize I may have been somewhat misled! This became abundantly clear when I found Mr T was actually spelled Mr Tea and, far from sporting copious amounts of gold jewellery, he had on show only one small tie pin (which some wag had said was to cover a bean stain)! As for Darth Vader, well ……. this was, of course, a non-metallic voiced but very pleasantly spoken Mr De’ath. However, skirmishes were to be observed, but the gentle good humour (no weapons visible) of these two, and many others who sparred, was a delight to observe; as was the very friendly nature of all those present who took both the time and interest to be most convivial to friends and strangers alike. The banquet on Saturday evening was, after a delightful repast, turned to the more serious (serious?) business of awarding certificates, medals and trophies but even the many jests between participants could not hide the achievements that, considering their having fought nature, mechanical failure and sometimes even personal tragedy, were very impressive. These achievements were made even more impressive taking into account the age range from pre-school to free bus passers. The quiet modesty shown and the determination to finish a job once started is a refreshing view of people who newspapers would have us believe no longer exist. Thank you for all your many good works done for so many people and thank you for restoring my faith in human nature.